It’s pronounced “bru-sketta”, not “bru-shetta”, my Italian friend informed me about a year ago. And so I learned that I had been mispronouncing this word all my life. Well, now that I know how to pronounce it properly, I feel confident to put my favourite recipe for it on the blog! I first found this recipe when I was eating a low-fat diet a few years ago and I ate buckets of it. Well, now we have learned that good fats are important for our health and I no longer count the grams of fat that I eat; but I still love this recipe for bruschetta and often make it as an appetizer for parties or just for a scrumptious snack. The flavours are big and bold and there is some crazy addictive quality that I cannot explain! The added bonus of this recipe is that it makes a healthy low-cal snack or appetizer. I love to serve it on warm bagels or warm foccacio bread. I guarantee you won’t be able to stop eating until the bowl is empty! Soak the sun-dried tomatoes in hot water until they are soft. Drain on paper towels and chop. 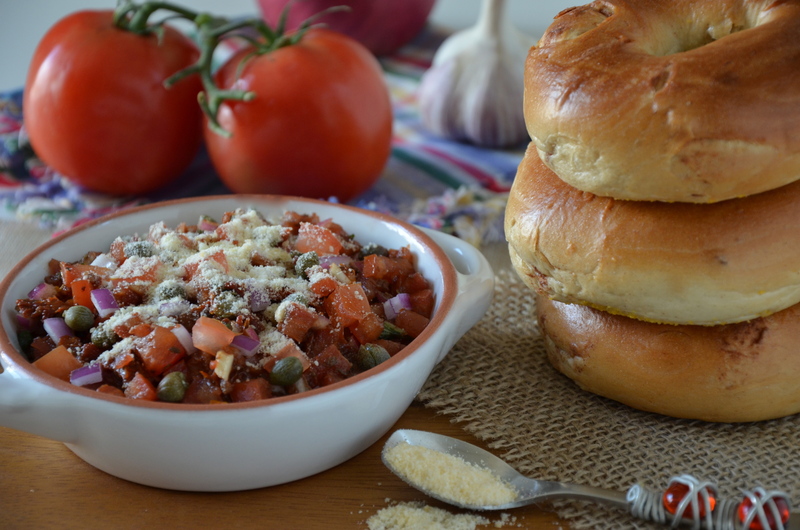 Mix all of the ingredients together in a bowl and serve on warm bread or bagels. Top with some freshly grated Parmesan cheese for the non-vegan version or serve it just as it is! This recipe also makes an awesome pasta sauce. Yum! Brusketta in Italy and around here where I live in the East Coast, but go anywhere else they’ll correct you and insist it’s brushetta. So I learn to pronounce it one way or the other based on where I am geographically, which I don’t always do successfully. Nice recipe with capers! Yes, you’re so right…I guess that “When in Rome…do as the Romans do.” applies with pronunciation as well! And yup, the capers are so tasty in this recipe. Thanks so much for stopping by and making a comment! Cheers. Looks great! Even though I know how it’s supposed to be pronounced, I can’t help but say the “wrong” way still! Thanks! Well, I guess that as long as the waiter knows what we are ordering, it really doesn’t matter 🙂 Thanks so much for taking the time to comment, I appreciate it! it always feels fancier when its foreign doesnt it? I feel like a gourmand whenever I eat this, even though it is essentially just bread with garlic, tomatoes and stuff. simplicity though…is a beautiful thing. Too true!! I have been thinking a lot about simple recipes these day and it is exactly that. There really is such beauty in simplicity! The bruschetta sounds so delicious. I really love sun dried tomatoes. Thanks for sharing! You’re very welcome! It’s quick, easy and soooo delicious. I really hope you like it! So glad to hear it! I could make a meal of it!! Thanks so much for stopping by and taking the time to make a comment! Well, that is so kind of you to say. I have been looking at your blog too and there is so much to explore. I am really looking forward to it! Happy Fiesta Friday! Thanks so much! It’s definitely one of the favourites at our house! Have a wonderful week!